If we’ve designed your website’s structure, it will be geared for SEO. The above tasks will maximise that inbuilt potential. However, because not all websites are designed optimally, we cannot offer a one-size-fits-all service. We’ll need to assess your site’s structure before determining what’s required. Let us know what you need and we’ll give you a fair and competitive quote. Plus, with all the services above (except Google Adwords Advice), we’ll throw in The Complete Guide to DIY SEO (42-page PDF) on the house. The above individual elements combine to over $825 worth of services. Our Turbo package is heavily discounted, covering all of the above for a once-off fee of $595. Don’t mess around. It’s too important to get wrong. Get your SEO working for you today! You can view our Pricing & Package Comparisons or return to the home page for an overview of our services. Yes, we do sell the three guides together as a bundle. 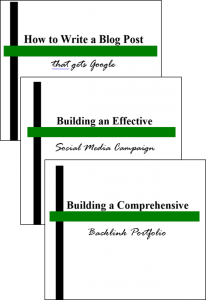 Each topic flows into the next, and if you know SEO, you’ll know how interlinked these three subjects are. Indeed, they are the very foundation of effective online marketing. The three guides combine to more than 110 pages of robust, proven strategies, tactics and practical tips to help you become a veritable SEO master. We’re so confident that there aren’t better resources around, we’ll refund your money if you can show us we’re wrong.